Education is compulsory in Singapore. All children from the age of 6 years old are required to start primary education for 6 years to establish a foundation in English, Mother Tongue and Mathematics. While the education system in Singapore is highly recognised in the region, there is a selection of international schools to meet the different curricula for example British, American or Australian. Expatriate children can start education from kindergarten right up through high school and continue with tertiary education at one of Singapore’s Universities or in their home country. Singapore has several established international schools with different education systems to choose from. Most schools have curricula starting from Nursery right up to High and Upper Schools. The table below provides an overview of some of the more popular schools. Tertiary education does not come cheap. With careful financial planning, you can provide your child with a quality university education anywhere in the world. 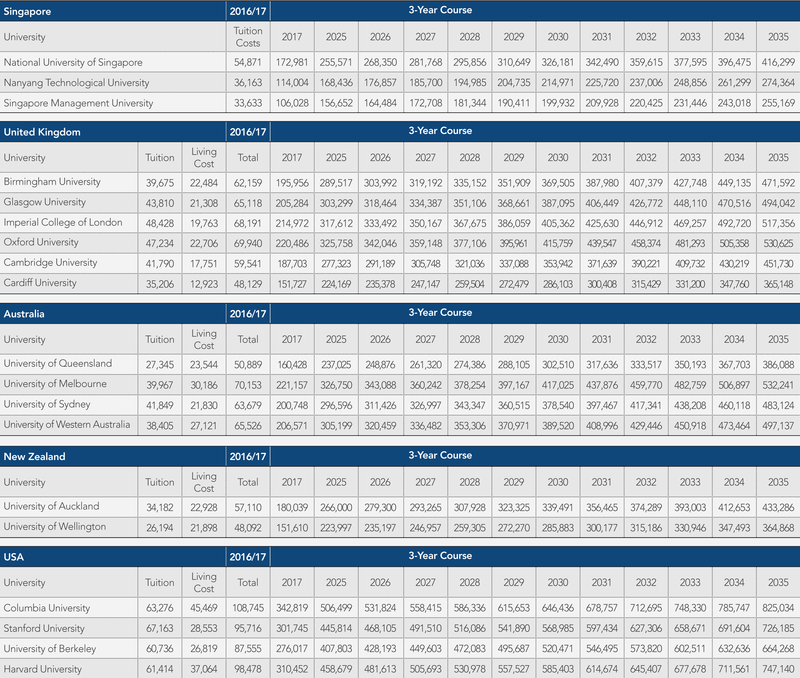 The tables below provide a cost comparison across universities in Singapore, Australia, the United Kingdom, New Zealand, and the United States.